This small north central Florida town of 3,600 is located about 20 miles northwest of Gainesville in Alachua County. High Springs tempts residents and visitors with diverse and unique offerings of art, antiques and outdoor adventures. Surrounded by natural attractions, the town attracts all sorts of outdoor enthusiasts for snorkeling, diving, tubing, swimming, canoeing or cave diving in natural springs that flow at a steady 72 degrees all year long. Ichetucknee Springs State Park stretches along the crystal-clear, spring-fed Ichetucknee River, about fifteen miles north of High Springs. Dive the springs or drift along on an inner-tube through unspoiled natural wilderness. 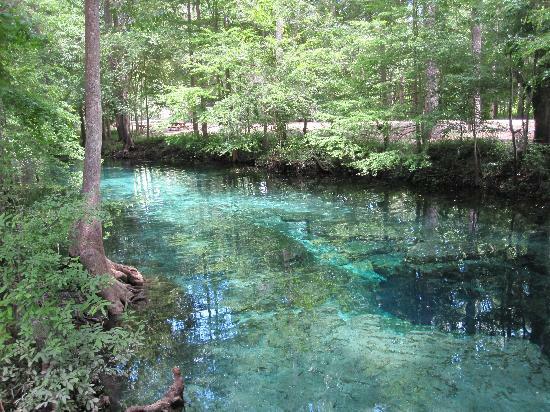 Blue Springs is a must see – family owned and operated since 1958 with 250 acres of the “Real Florida”. Stroll along the 1/4 mile boardwalk as it follows the springs run into the scenic Santa Fe River, or gaze into the crystal blue depths from the dock overlooking the springs boil. A dip into 72 degree water is sure to leave you feeling refreshed and recharged. Ginnie Springs is a mecca for serious scuba divers. Nine springs, including the incredible Devil’s Eye, well up in sparkling abundance. Tubing and canoeing on the Santa Fe River and camping in wooded sites complement the excellent diving. Poe Springs Park is five miles west of High Springs on the Santa Fe River. Recently renovated, it has been a popular attraction for decades. O’Leno State Park, six miles north of the heart of High Springs, is on the site of the old town of Leno. In the 1930s, the Civilian Conservation Corps developed it as one of Florida’s first state parks, and the rustic buildings and suspension bridge the CCC built over the Santa Fe River are still in use. Within the borders of the park is the land bridge created when the river sinks below the surface, only to emerge several miles away. Camp Kulaqua, site of historic Hornsby Springs where many prehistoric artifacts have been recovered, offers horseback riding, camping, water sports and a zoo.